Grease three 13 x 9 x 2-inch baking sheets. Break up the almond paste in a large bowl with a fork. Add butter, sugar, egg yolks, and almond extract. Beat with electric mixer until light and fluffy, about 5 minutes. Beat in flour and salt. Beat egg whites in another bowl until stiff peaks form. Fold into almond mixture. Remove 1-1/2 cups batter and spread evenly into one of the prepared baking sheets. Remove another 1-1/2 cups batter and tint with green food coloring. Spread evenly into second prepared sheet. Add red food coloring to remaining 1-1/2 cups batter and spread into third sheet. Bake for 15 minutes or until edges are lightly golden. Immediately remove cakes from pans onto wire racks. Cool thoroughly. Place green layer on upturned baking sheet. Heat apricot preserves in a small saucepan and strain. Spread half the preserves over the green layer to edges. Place yellow layer on top. Spread with remaining preserves. Place red layer, top-side up, on yellow layer. Cover with plastic wrap. Weight down with a large wooden cutting board or heavy tray. Refrigerate overnight. Melt chocolate. Trim cake edges even. Frost top layer with chocolate. Cut into strips 1-inch wide by 2-inches long or cut into small squares. 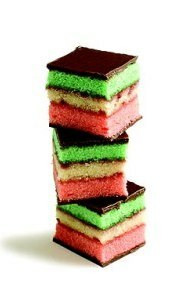 These rainbow or tricolored cookies with a chocolate glaze are a favorite in Italian-American homes at Christmas but they are delicious any time of the year. They are a bit fussy to make but the results are a very pretty cookie with a rich almond flavor. It is best ot have three baking sheets that are identical in size so that you can use one for each layer. But you can still make the cookies with only one baking sheet if you bake one batch of dough at a time.